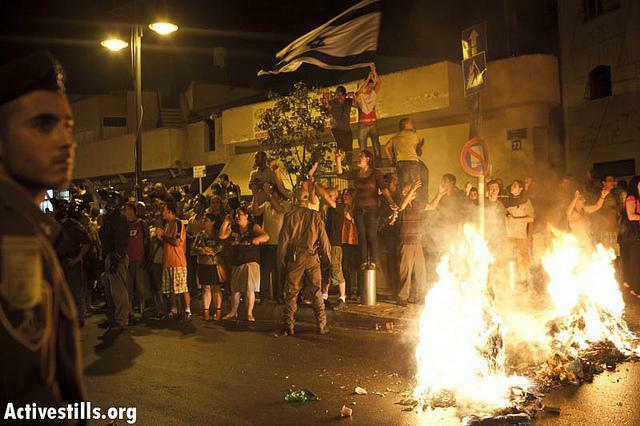 A week ago, on the night of Wednesday 23rd May, South Tel Aviv erupted, becoming the epicentre of an attack by an angry, violent mob against members of the city’s African migrant population, deliberately targeted because of no other reason than their ethnicity. African-owned businesses and homes were destroyed and looted. There were no fatalities but many were injured. Social media was alive with images and information regarding the attacks, pointing out the absolute apathy, even complicity, of the authorities. This attack on the African minority in Tel Aviv is not an isolated event. Wednesday night’s violence was the culmination of a series of racist attacks, including the firebombing of homes and a kindergarten in south Tel Aviv neighbourhoods. In fact, these attacks illustrate the prevalent high level of racial tension within the city and in Israel as a whole. Zionism, in other words, dictates racial and religious supremacy. Israel, a state built on ethnically cleansed land, thus operates under the veil of a democracy in which the Jewish population is the exclusive beneficiary of the democratic process. However, Israel’s Jewish population is itself stratified within an ethnic hierarchy, where the prosperous Ashkenazi (white Jews of European descent) dominate the economy, media and politics. In comparison, the Mizrahi and Sephardi (Jews of Middle Eastern and North African descent) suffer socio-economic hardship. Discrimination continues into higher education, employment, healthcare and housing. If we consider the core principle of Zionism, the construction of a Jewish homeland in order to preserve Jewish identity and ensure Jewish security, this oppression is inevitable. However, it is the treatment of black Jews that reveals most about the racism ingrained in Israeli society. Hanan Chehata writes, in the Race and Class journal, that ‘the Falasha, Ethiopian Jews … brought to Israel in mass transfer operations, have found themselves relegated to an underclass.’ Chehata argues that black Jews are not only racially discriminated against but are also used to bolster the populations of illegal settlements. In 2010, the Israel lobby group FLAME (Facts and Logic About the Middle East) ran an advertisement in Jewish American newspapers in an attempt to refute claims that Israel is an apartheid state. The advertisement argued that ‘Israel has brought in about 70,000 black Ethiopian Jews, who despite their backwardness have become fully integrated citizens of Israel.’ The advertisement perpetuates the image of the uncivilised savage; we might expect to find such language in nineteenth century European colonial texts. The drug has a wide range of damaging side effects and was used by the South African apartheid government to limit the fertility of black women. Yali Hashash, a researcher at Haifa University said similar practices were used against Mizrahi and Sephardi Jews in the 1950s and 1960s because ‘Israel’s leading gynaecologists regarded Arab Jews as ‘primitive’ and incapable of acting ‘responsibly’.’ The evidence is difficult to refute and presents a compelling conclusion: the preservation of Jewish identity in the eyes of the state appears only to encompass white Europeans. A familiar tune: in 1915, the CUP described the Armenian minority in Ottoman Turkey as a threat to Turkish security and identity. The Ottomans’ chief propagandist, Ziya Gokalp, insisted Turkey could only be revitalised if it rid itself of its non-Muslim minorities, arguing that Armenians were ‘a foreign body in the national Turkish state.’ A few years later, Nazi propagandists Goebbels and Rosenberg propounded the central notion that Germany needed to be Judenfrei (free of Jewish presence) in order to revitalise itself. In both instances, these fabrications created the cultural space for racial hatred and were the pretext for genocide. In the same interview, Yishai warned that ‘the migrants are giving birth to hundreds of thousands, and the Zionist dream is dying.’ As mentioned earlier, the Israeli state appears to be taking direct action to preserve the ‘Zionist dream’ that Yishai refers to. If it is not the state’s intention for foreign migrants to assimilate themselves into the very fabric of Israeli society then we can only assume their sole collective purpose is to be exploited, to have their labour power extracted before being removed. In a democratic system, the words of politicians are expected to influence our own actions and attitudes. The racist mistruths and scaremongering perpetuated by Israel’s high-ranking parliamentarians have undoubtedly ignited anger and hate towards the African migrant community, inciting the pogrom in south Tel Aviv. Wednesday night’s violence followed an angry protest-rally, during which high-ranking members of the ruling Likud party delivered racist, vitriolic speeches. MK Miri Regev, echoing pre-genocidal rhetoric, described African migrants as ‘a cancer in our body’, blaming ‘leftists’ for the fact that the government has not pursued a policy of mass expulsion. MK Danny Dannon, also spoke and later posted on Facebook that ‘Israel is at war. An enemy state of infiltrators was established in Israel, and its capital is south Tel Aviv’, referring to African migrants, a significant proportion of whom live in the district. Upon the conclusion of the rally, a mob of an estimated 1000 Israelis approached the African migrant neighbourhood in south Tel Aviv. Police halted the mob’s progress, stopping them from crossing a bridge that leads into the heart of the residential area and arguably avoiding a massacre. The mob proceeded to rampage through the Hatikva neighbourhood, attacking African men and women they encountered. An Eritrean woman was assaulted with bottles on Hanoch Street. The baby she was carrying dropped to the floor. A Sudanese man was set upon as he sat in his car and the windows were shattered. The mob chanted slogans like ‘The people want the Sudanese deported’ and ‘Infiltrators get out of our homes’ as they careered through the streets. The violent rampage continued for several hours through the night, resulting in a surprisingly low amount of arrests, between 11 and 17 depending on sources. Derfner’s comments validate the argument that while Zionism can accommodate liberal and humanistic discourses, it cannot be practised without the abuse and disregard of the rights of those who are not Jewish. The Israeli media have been quick to emphasise that impoverished, working class Mizrahi Jews have carried out the attacks on African migrant communities. This reinforces the ethnic hierarchy and creates a space in which the Israeli authorities can deflect responsibility for both the violence and the conditions in which the Mizrahi subsist. Predictably, the old colonial tactic of divide and rule is all too evident here. The ruling class are the cause of the hardship that the Mizrahi and Sephardi suffer. Through rhetoric and vitriol they are able to redirect anger toward African migrant communities who are victims of greater oppression themselves. If the Israeli authorities continue to downplay and ignore what happened in Tel Aviv last week, there will undoubtedly be a repeat. If the men and women who govern Israel continue to fuel the fires of racial hatred, the severity of the violence will increase and the scale will spread. Been waiting for an article making the connection between these attacks and zionism! This is an absolute joke of an article. Israel is the only country in the whole of the Middle East (and Africa) that did ANYTHING to take these people in. They were used as target practice by the Egyptian army before being rescued on the border, but I suppose that won’t be written about by rabid haters like you. Equally, the riots were shameful, and as someone who lives alongside these refugees in Tel Aviv, I can tell you the massive majority of people here feel the same way. Extreme politics is an unfortunate byproduct of real democracy, and unfortunately that’s what’s caused this bad event. Another connection that I’ve found in these protests (as I live in the neighborhood and have gone to view them and do patrol against violence) is that they bring A LOT of children. In fact, it was revealed that the gang recently caught who were going around and beating up black people were mostly minors. At protests, you see young kids 6-10, shouting racist things and carrying racist signs. The only way that one can trigger such a hatred at a young age is if the children are already inculcated with a sense of hatred for the other. Zionist education maintains this line, such that even the youngest children can respond to the call of Jewish Supremacy – it’s in the background of almost everything related to the state. Indeed, Zionism is a large part of the problem that has led to this pogroms. If this were a culture that had a sense of multiculturalism (which is should, given that it is made up of many different cultures and is located in a place that is not native to them), there would be much less of this violence. It is an ethnocracy and so there is going to be continued pogroms against easily identifiable non-Jews. Now, THAT’S hate-speech. “Othering,” at it’s most wantonly lethal extreme. I hardly think I need to point out the disturbing and tragic historical parallels in that. And as saddened as I am by all of this, I’m now feeling compelled to go re-read Troy Duster’s 1971 essay, “Conditions For Guilt-Free Massacre.” I need to be reminded of what I can do to help repair the damage done by such feckless rhetoric as Daniel has shown us. Fantastic, well researched and well written article, thank you guys. I think it’s easy for international anti-Zionist/pro-Palestine activists to underestimate the racism that exists within the state of Israel itself – despite the inseparable link between them. Let me quote the foremost defender of human rights of our age – Martin Luther King – who said ” If you are anti- Zionist, you are anti – semitic my friend.” By the way, Ashkenazi Jews are historically Jewish, and genetics show that they are just as Middle Eastern as their fellow Jews in the rest of the Middle East. Your cynical attempt to racialize this issue in your reference to ” white Jews ” shows an agenda or lack of education. When Moses”s sister objected to him marrying an Ethiopian women she was punished with leprosy. She recanted and was healed later. is done only at the Jewish day schools.